Blockchain technology promises to transform economies and change the way enterprises and governments work. But how much of this is hype and how much is actually happening on the ground? Over 50 countries are working actively to develop blockchain standards and a conducive regulatory framework to integrate blockchain into their economies. Even in India, a traditionally tech-cautious country, 50% of state governments are investigating blockchain-driven citizen service use cases and initiating projects that are delivered by both large providers and start-ups. Clearly, the wind is blowing in blockchain’s favour globally and in India. 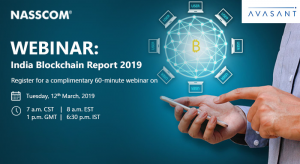 This webinar will bring out the insights from over 50 stakeholder interviews across the global and Indian blockchain value chain, and will help digital leaders cut through the hype and understand the actual trends in this space. Attendees will develop a better understanding of what the roadmap for blockchain looks like and what different industry participants, such as enterprises, governments, regulators, service providers and startups, are doing to leverage the global and Indian blockchain related opportunities.